Alarm at 5:30 am. In the pool at 6 am. Out of the pool at 7:10. Home to get Princess Grace ready for crazy hair day. Drop Grace off and home again. Chocolate peanut butter banana smoothie for breakfast. Then core and arm strength. I don't recommend ab work right after drinking a smoothie. Lesson learned. Showered. Ready for the day. Time with my mom, who is in town from AZ. Then hit the summer movie (Turbo!) 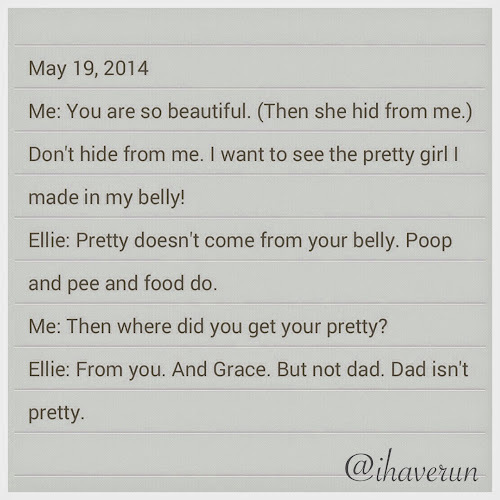 with Ellie. Picked up Grace. Went to Michael's so she could spend a gift card she's had for almost three months. Home. Made dinner. Black bean enchiladas. Didn't eat though because I had dinner plans. Partied it up (which of course means eating) like only five girls can do when celebrating the baby growing in Megan's belly. And here's a close-up of my salad because it was super yummy! Email ihaverun@gmail.com to claim your Cocogo. Everyone else will have another chance to win some Cocogo on Runnerd.com starting Sunday! Running brought this girl into my life. 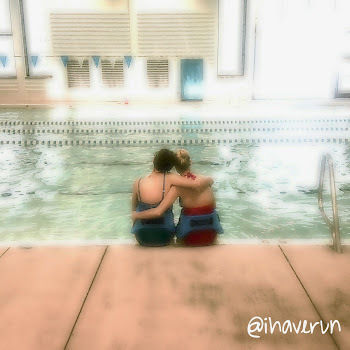 And my running injury has given me some of the best mornings ever while pool running with her. 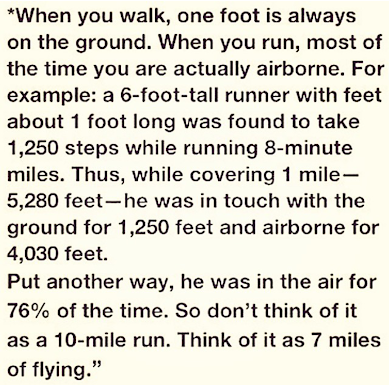 And running will make me even happier, once I can do it again, now that I know this. 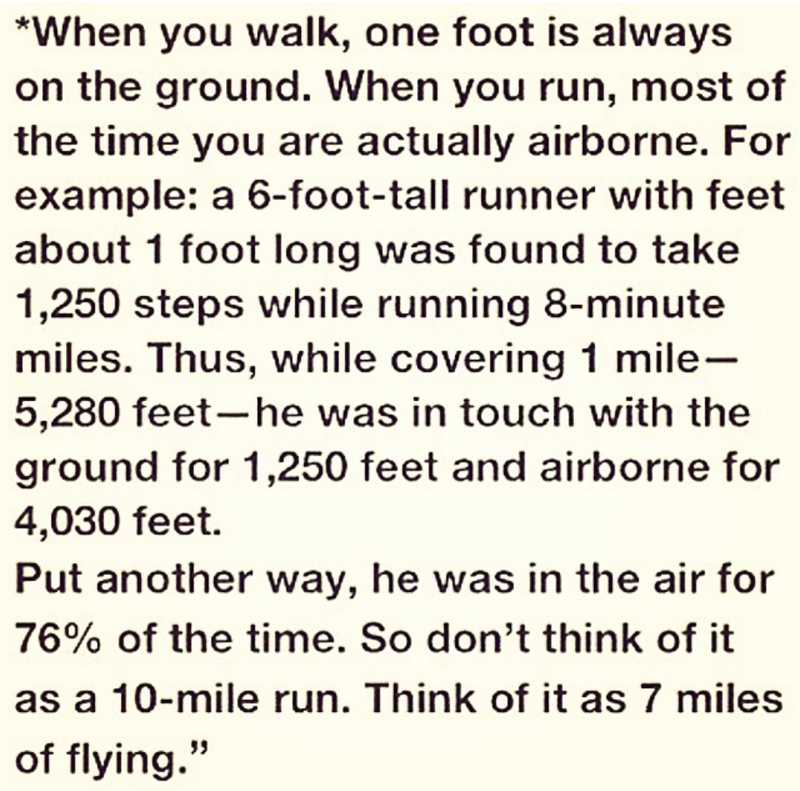 I will think of how I'm actually flying every time I go for a run. Tell me one thing makes you happy. In between was some serious fun. Or in Grace's words, "One of the best days ever." More about that tomorrow. Right now I have to get some sleep so I can get up bright and early to entertain some lifeguards. Have you entered my Cocogo giveaway yet? You should! Find out why it's great and how to enter HERE. Two hours of pool running. Running clothes over your swimsuit makes it more legit. Trust me on this. A Swig cookie. Which I feel good about since I spent two hours pool running. Have I mentioned pool running makes you seriously hungry. Again, trust me on this. Then I put on real clothes. After showering, of course. However I think the chlorine has seeped into my skin so much it is like my new perma-perfume. And yes, these are my other favorite pants. Because I know you were dying to see them after my last post. Do you know who Satchel Paige is? If so, the hubs will be proud. What are your favorite cookies? Hands down, mine are sugar cookies! Don't forget to enter my Cocogo giveaway HERE! Princess Grace became an author this week. 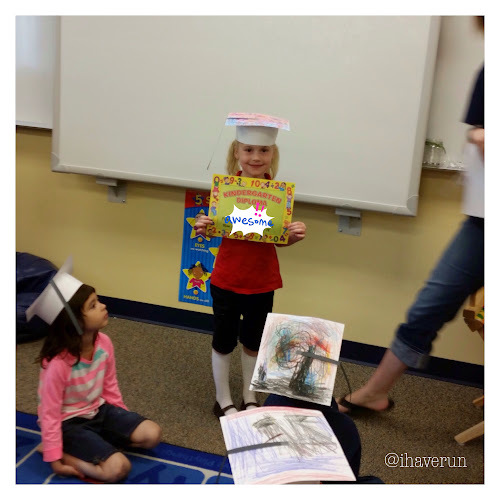 She was one of two students chosen in her second grade class to take part in her school's Story Studio program. The students spent two hours every week for eight weeks working on writing their own book. At the end of the eight weeks, the book was published. The fam went to a special celebration where the authors received a printed copy of their book. A hard cover copy will be kept in the school library. Needless to say, it made this mom happy to see how much she loved it! This also made me very happy. I am so ready for summer! I'm just trying to ignore the fact that this is basically the most perfect month of the year to run outside. Speaking of the the fact that I can't run, this is one of the things I'm doing to help ensure there are no more stress fractures in my future. Since taking calcium the size of horse pills wasn't working out for me, I tried the chewables. It was the right call. I'm also getting extra calcium in the form of fro-yo. Can you tell which one is mine and which is Ellie Bean's? When you meet your favorite friends to get fro-yo in the middle of the day, it requires adult clothing. So I wore my new pants. These pants are my new favorites. Actually they are tied for favorite with a navy pair I have exactly like them. I bought the navy ones a few months ago during a 1-day sale when they were $10 (normally $30!). I loved them so much, I went to the store several times hoping to find a khaki pair in my size. Last week one of the girls who worked there offered to call other stores to try and find them. She finally found a pair in my size in Colorado. On clearance. For $10.50. Sold! What are your favorite fro-yo toppings? Any fun Friday night plans? I have moments where I miss running so much it hurts. Literally. Like I feel it in every inch of my body. It's an ache that feels like something is pressing on my chest and I can't catch my breath. Those moments always catch me off guard. Like when we were heading to Park City on Saturday to watch the State Lacrosse Championship game. We were driving all innocently on a road that, during the winter, I ran on at least a few times each week. And boom. 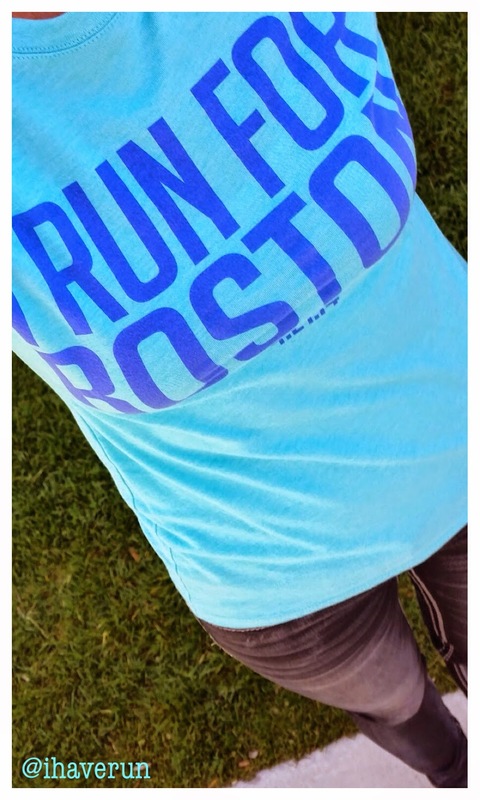 I was flooded with images from my runs on that road and overwhelmed by how much I wanted to get out and run. Or driving my girls to school. There are a lot of runners on one of the roads we drive on, and usually I hardly notice them. But then bam. I'll see one of them and just long to be out there. Running. Luckily I have pool running to pass the time and help me stay sane. I was on the fence about going yesterday because getting up at 5:30 am is not easy for me and the thought of sleeping in until 7 was REALLY tempting. But Scott encouraged me to go. And then I got a text from Janae saying she was going. So I went. I never regret it. And I don't even mind being tired because it's always worth it. Today I took some Cocogo with me to drink after our "run" because I knew we were planning on going 90 minutes and were going to push it a little harder with some sprints in the middle. If you haven't tried Cocogo, you should. I was a little afraid to try it because I have tried other coconut water and have not been a fan. Cocogo is yummy! I haven't had it during or after a run yet, but I used it during several of my sweat-fest cycling sessions. It is great for rehydrating and not too sweet like a lot of sports drinks. I really love the grape flavor. The lemon-lime and raspberry passion fruit are both good too. And that says a lot because I'm usually not a lemon-lime drink fan! Cocogo wants to give one lucky IHR reader the chance to try all three flavors. The winner of this giveaway will receive a 12-pack box of each flavor and a Cocogo Polar Bottle! 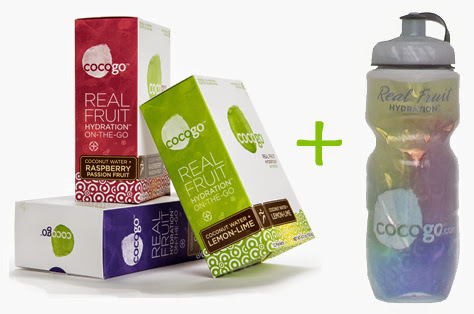 Cocogo is a new premium sports drink made with real fruit and coconut water in stick pack. It is all-natural and isn’t overly sweet. Cocogo provides steady energy, no muscle cramps, is easy on the stomach, and prevents “the bonk.” And when you compare Cocogo to other sports drinks, it offers the best balance of electrolytes, contains an ideal blend of sugars, and has seven essential vitamins. Winner will be selected by Random.org on Friday, May 30. 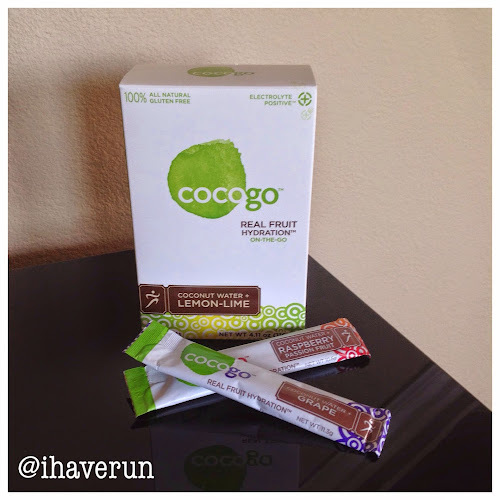 You'll have another chance to win some Cocogo when Runnerd.com launches on June 1 and hosts another Cocogo giveaway!! My Ellie Bean is a rockstar. She had tubes put in her ears and her adenoids taken out yesterday. She was a little nervous yesterday morning but was such a trooper about not being able to eat or drink anything. When it was time to go back for the procedure, she asked me to come with her. 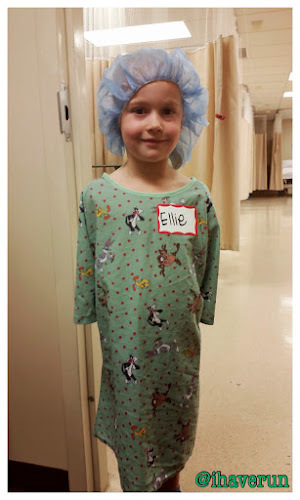 When I told her I couldn't, she put on a brave face and chatted with the nurse while he walked her down the hall to the operating room. It made my heart hurt a little to let go of over her tiny hand and watch her walk away. After the procedure, she wanted two things: the IV out and to go home. She was just cooperative enough about eating something (jello!) so they would let both of those things happen. She took a little nap on the way home, and then she was back to her normal self. 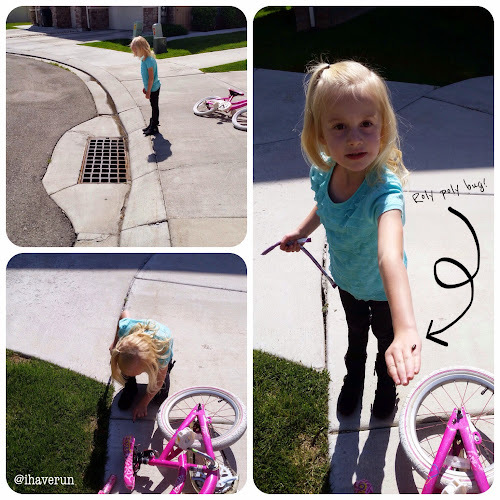 She wanted to blow bubbles, swing and ride bikes. 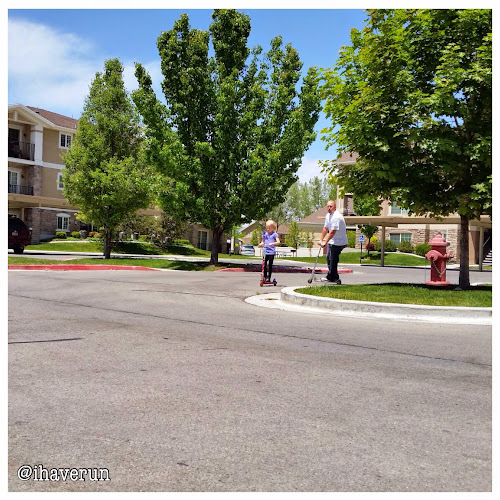 Then she got hungry, so we talked her into a scooter ride with her dad to get a movie at the Redbox to watch while she ate her lunch to help her slow down a little for a few hours. Ellie has always had a really high tolerance for pain. She's had ear infections almost constantly since January without hardly any complaints and round after round of antibiotics. 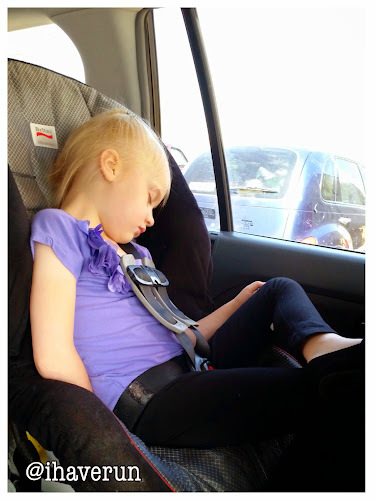 She once had a double ear infection that she described as her ears "itching." So it's no surprise her right ear (which was infected at the time of surgery) hurt "only a little" and her throat stopped hurting after her little catnap on the drive home. Other than a little raspiness in her voice today, you wouldn't know anything had ever happened. It makes my heart happy every time I see it. And before that, I made the rest of me happy with an hour at the pool with Janae. It was our third day this week. 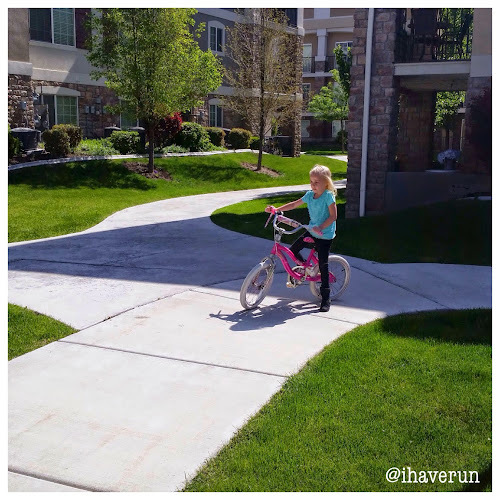 We added some sprints to mix things up today. We did 30 seconds hard with 30 seconds recovery x 30. I could really feel my legs working, especially when I got out of the pool and had to put my weight on them again. 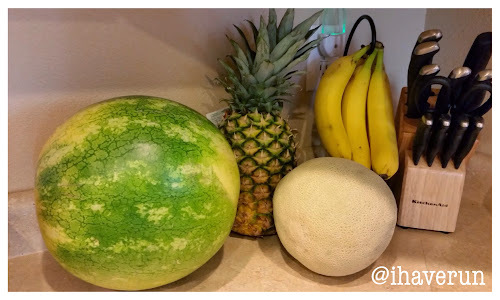 All the pool running has made me a hungry girl, so I stocked up on fruit so I have lots of easy, healthy options. I spent an hour cutting it up today so I can grab some any time I need a snack. Tell me something that makes YOUR heart happy. Sunday I made cookies. 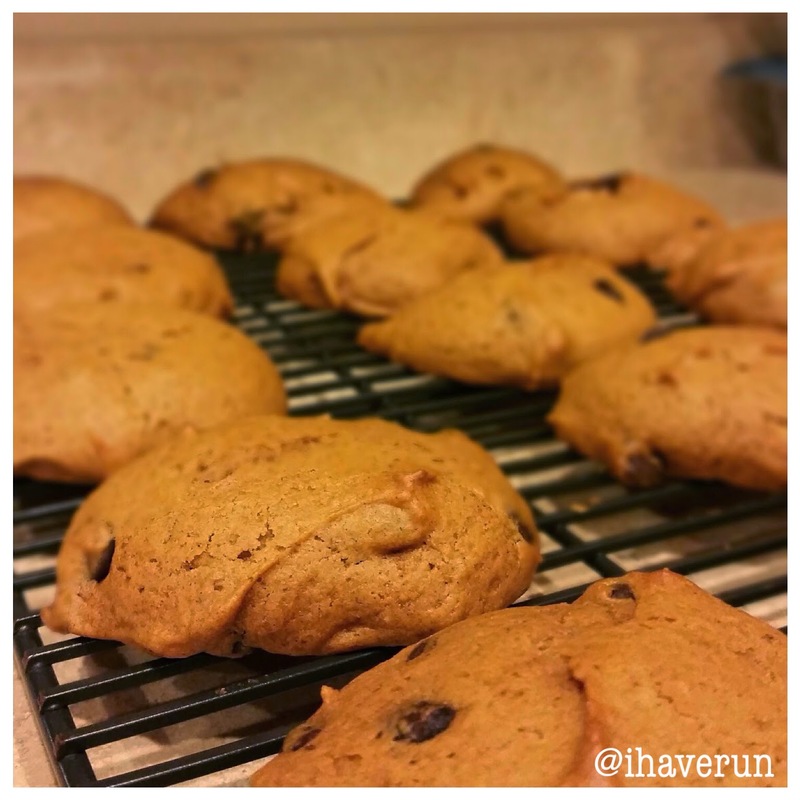 After my first one, I realized I mostly just wanted the chocolate chips in them and would have been just as happy with a handful of chocolate chips. Don't worry though. We'll somehow manage to eat them all. Yes, I pulled over to write it down because it's one of those moments I want to remember. Then my Ellie had riding lessons. 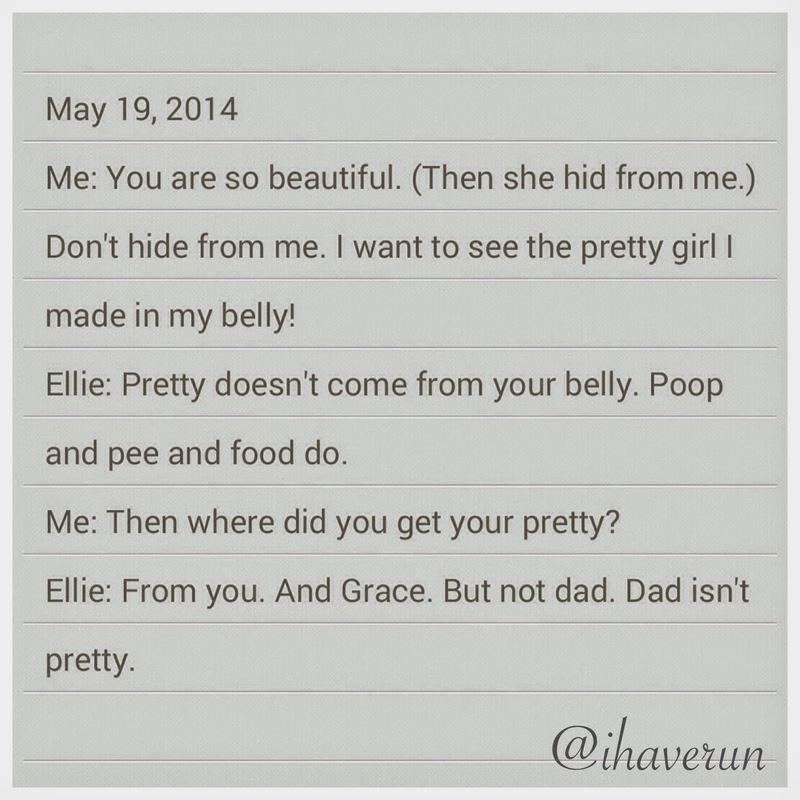 We rescheduled them this week because Ellie Bean is having an adenoidectomy and tubes put in her ears today. 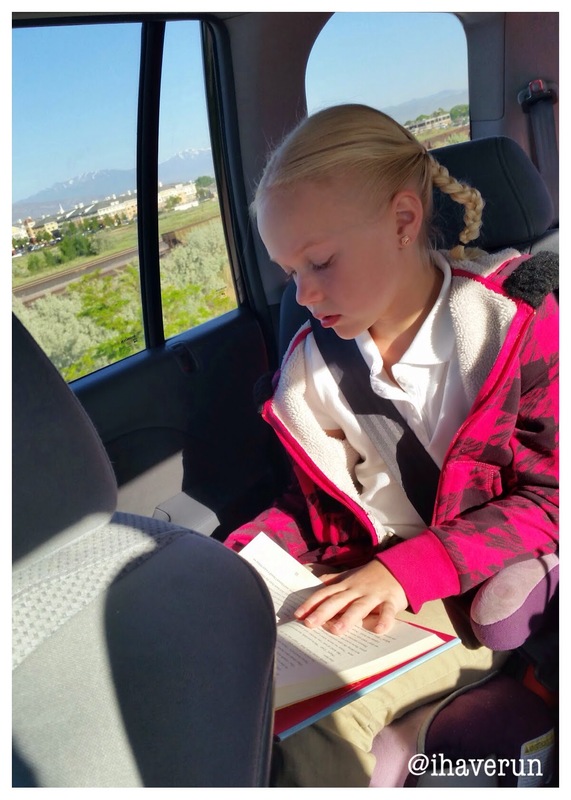 It was a perfect start to her week because there aren't many things that make her happier. 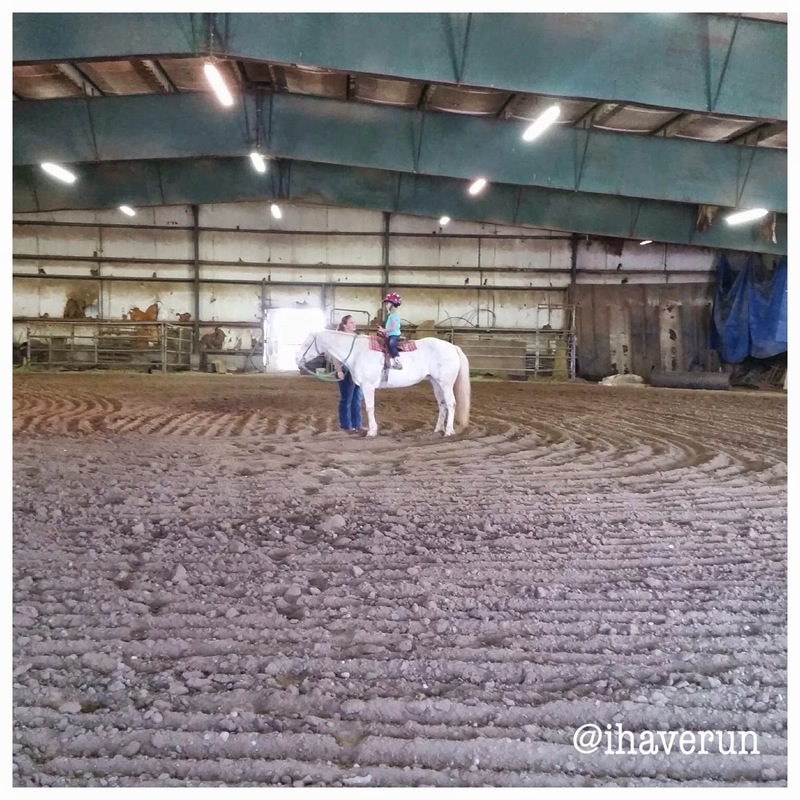 After riding lessons, she wanted to do the next best thing to riding a horse. Riding her bike. I normally take my scooter to keep up with her, but my stress fracture won't allow me that luxury right now. So I followed on foot. However, keeping up with her isn't too hard since she is easily distracted. 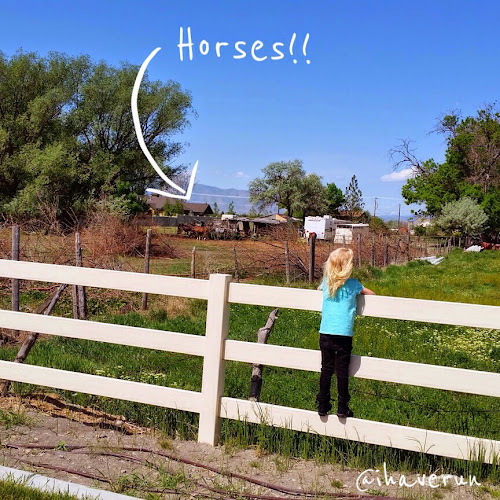 Our main destination was of course going to see the horses in a field behind our house. Then she practiced her cartwheels before we headed home to clean the house. She cleaned all the mirrors and dusted the house while I tackled everything else. I have to take advantage of this window of time when she thinks cleaning the house is fun! And yes, we matched today. But I promise it was just a coincidence. I'm loving this teal color right now! What color are you loving? Do you call them potato bugs or roly poly bugs (yes, I had to look up the spelling of roly poly)? Friday, my little Bean graduated from kindergarten. I can't believe my baby is going to be in first grade. I'm going to miss my little sidekick in the afternoons next year! Friday night I experienced Art City Donuts for the first time. 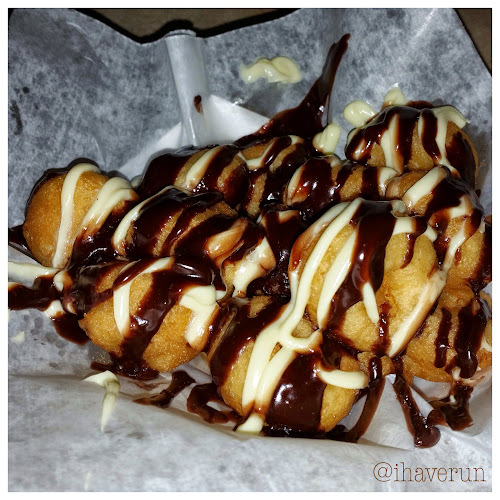 Yes, the Boston Cream Donuts ARE as good as they look. And sound. Now I have to try all the other flavors to compare, of course. 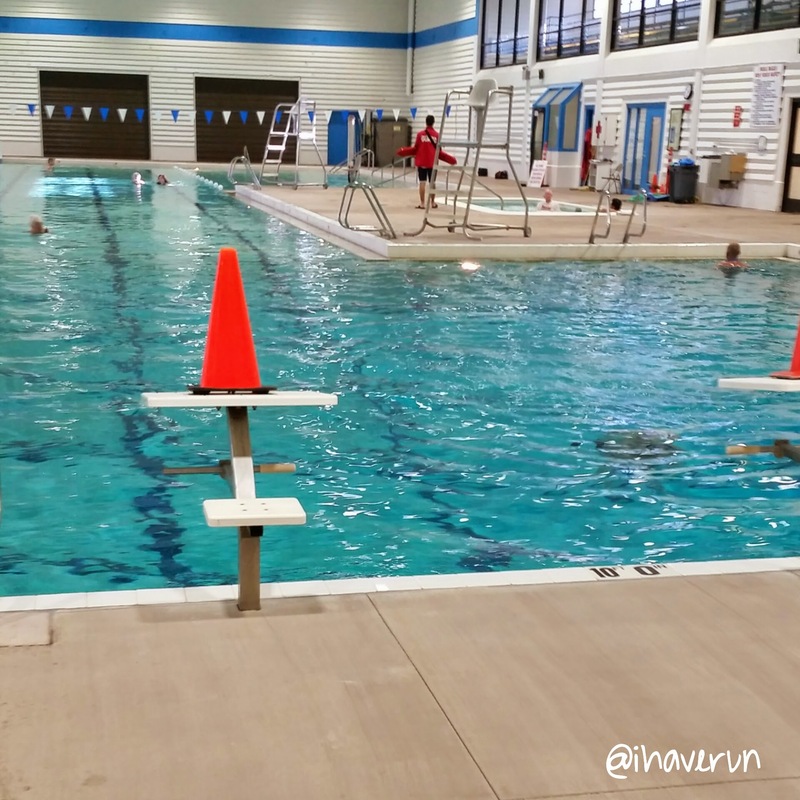 In addition to pool running five days last week, I got in three core workouts. 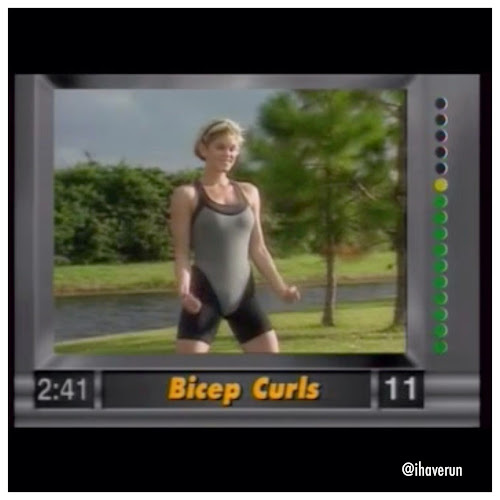 The best was doing 8-minute abs and some planks on the lawn out in front of the rec center on Saturday morning. I met Janae there at 5:50 am so we could start our 2-hours of pool running only to find out the rec opens at 7 am on Saturday. Lame. But instead of hitting up IHOP or going back to bed (which were both seriously considered), we made the most of our time and worked on our cores. And because I could talk to Janae forever, those three hours flew by!! I also got in two strength sessions last week. One of those included this gem. By gem, I'm not referring to the fact that she isn't using any weights for her upper body workout. I'm all about adjusting your workout to your fitness level. I'm talking about her leotard over those shorts. How did that EVER go out of style? 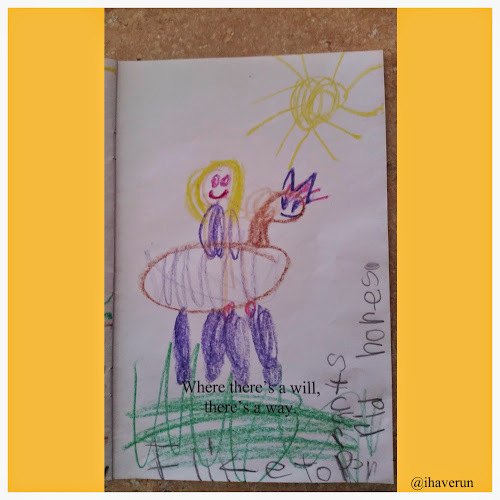 And because I can't let that be the last image in your head, here's the picture Bean drew to illustrate the saying, "Where there's a will, there's a way." Her caption says, "I like to practice riding horses." And here's a pic of my girls doing their favorite thing. 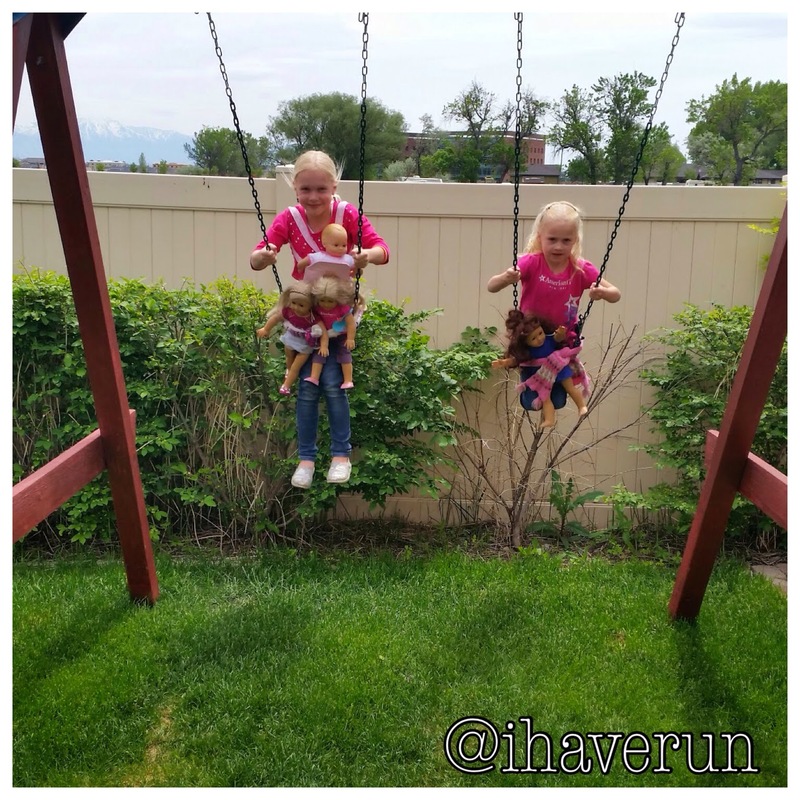 This swing set was one of the best investments we have ever made! 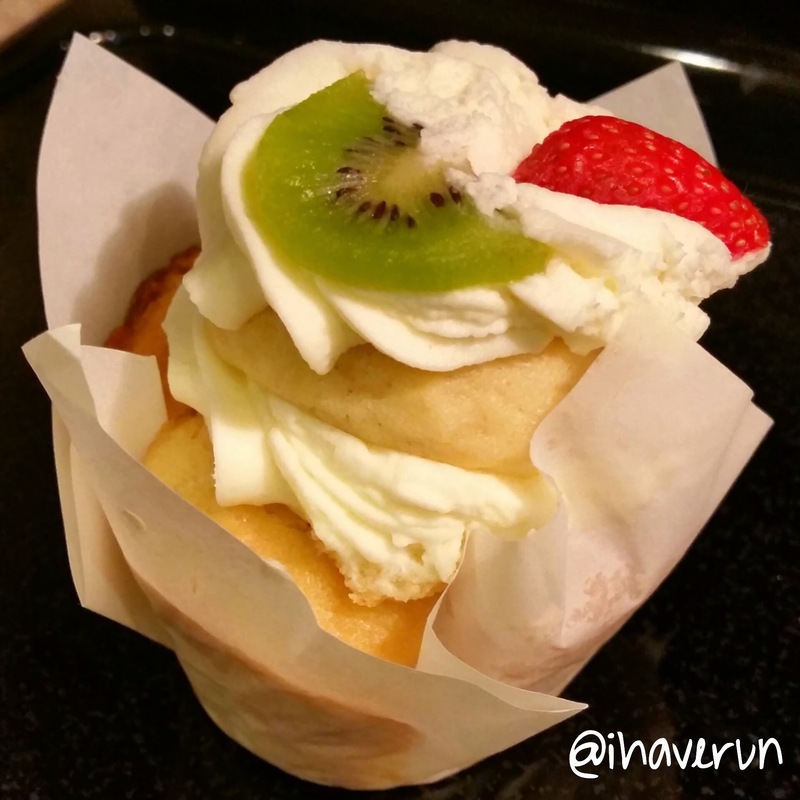 What's your favorite food truck treat? Are you doing anything exciting this week? I might forever associate the smell of chlorine with having this stress fracture. It's been different spending my mornings at the pool. It takes more thought before I head out the door. And it takes more of my morning than running does. But it's worth it to let my leg heal so I can come back stronger. When I do new things, I like to know what I'm getting myself into. Before I got pregnant, I read a lot about how to have the healthiest pregnancy possible. Once I was pregnant, I read and researched all I could about the best things to do for my new baby. 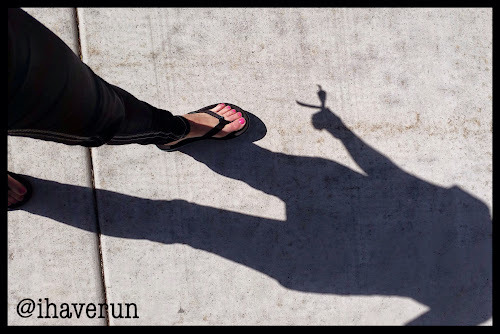 Since I started running, I have spent hours reading about different ways to stay healthy, different workouts, running methods, techniques and everything else. So when pool running became my new form of exercise, I spent some time researching proper form, the best workouts, etc. 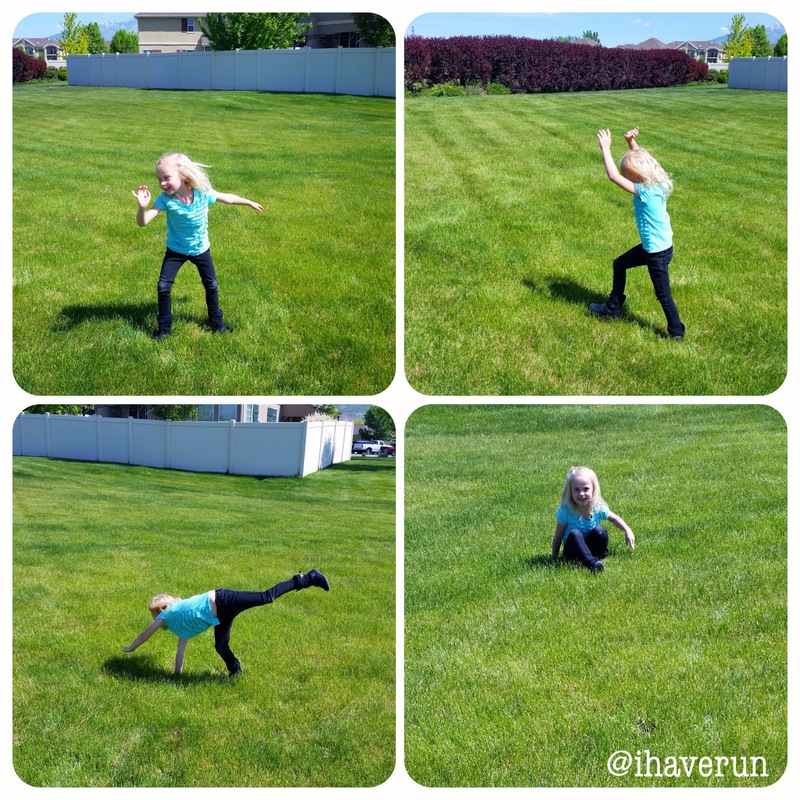 Your form should mimic running on land. 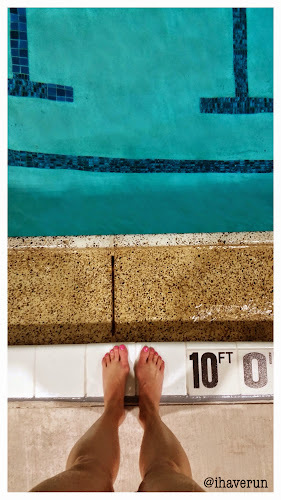 You should do it in the deep end because your feet should not touch the bottom of the pool. This can't be done properly without a flotation belt. Proper form also means swinging your arms like you would while running. Music helps the time pass more quickly. It also helps maintain a faster cadence. 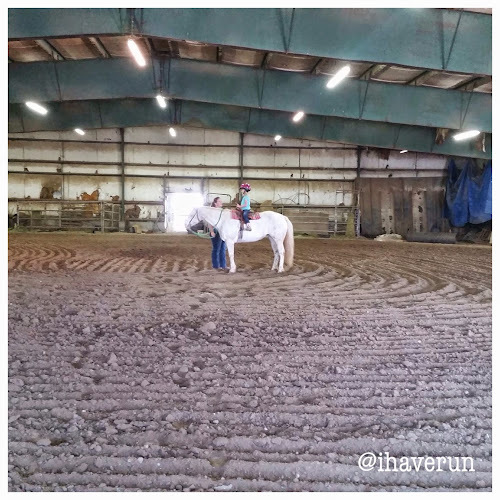 Your turnover should be about the same as when you run on land, ideally around 180. 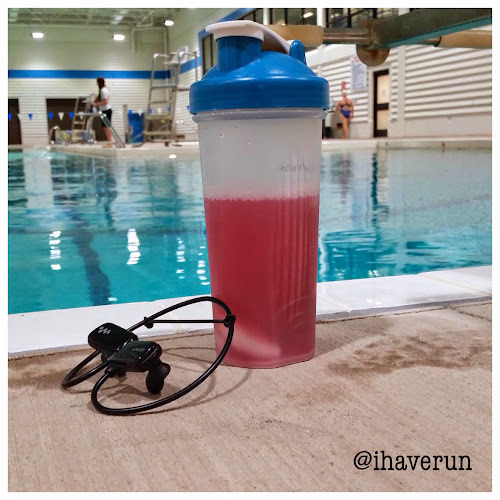 I check my turnover speed in the pool every 5-10 minutes to make sure I am keeping it fast enough. Having a friend to "run" with and talk to makes the time pass even more quickly than listening to music! Janae joined me this morning and the hour she was there flew by!! Showering before you get in the pool is a good idea. The main reason is that you get so cold between the shower and the pool that the water feels warm when you first get in and isn't a painful transition. To get the most benefit from your pool running sessions, add speed bursts. This has been easier with music because I just focus on speeding up my turnover on the faster songs. Pool running actually burns more calories per minute than land running. From what I've read, it sounds like this is partly because the water forces your body to generate more heat to keep itself warm. Whatever the reason, I'll take it! 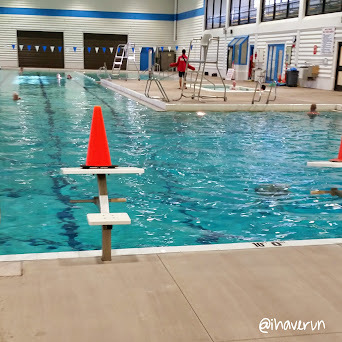 Have you tried pool running? Did you love it? Are any of you swimming as cross training or in prep for a tri"
Have you seen any funny signs lately?